The resistance of the PTC thermistor increases when a switch of the position control ECU and switch assembly is held down even after the seat has been moved to the farthest possible position in one direction. If the resistance increases beyond a specified level, the current is shut off to prevent a short circuit. 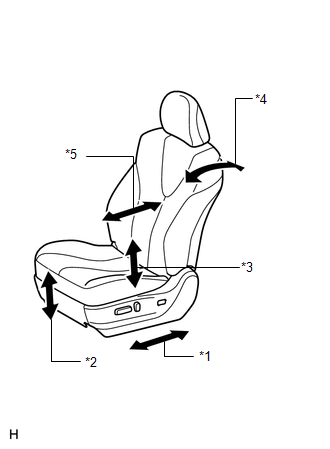 The inspection should be performed with the seat installed in the vehicle. Perform the 4 steps below to check the full range of motion for each power seat function. (1) Choose a power seat function. Operate a switch of the position control ECU and switch assembly and move the seat to the farthest possible position in one direction. Keep the seat in that position for approximately 60 seconds. (2) Operate the switch of the position control ECU and switch assembly again and continue to try to move the seat in the same direction as in the previous step. Measure the time until the current is shut off (motor operation sound will stop). (3) After the current is shut off, release the switch of the position control ECU and switch assembly and wait for approximately 60 seconds. (4) Operate the same switch of the position control ECU and switch assembly and move the seat in the opposite direction. Check that the motor operates. (a) Check the PTC operation inside the lumbar support adjustment motor. (1) Operate the front lumbar power seat switch and move the lumbar support to either the foremost or rearmost position. Keep the seat in that position for approximately 60 seconds. (2) Operate the front lumbar power seat switch again and continue to try to move the lumbar support in the same direction as in the previous step. Measure the time until the current is shut off (motor operation sound will stop). (3) After the current is shut off, release the front lumbar power seat switch and wait for approximately 60 seconds. (4) Operate the front lumbar power seat switch and move the lumbar support in the opposite direction. Check that the motor operates. (1) Turn the ignition switch off and move the shift lever to P.
(2) Disengage the seat belt tongue plate from the buckle. (3) Make sure that the seat slides rearward. (1) Turn the ignition switch to ACC or ON or engage the seat belt tongue plate to the buckle. (2) Make sure that the seat slides forward. 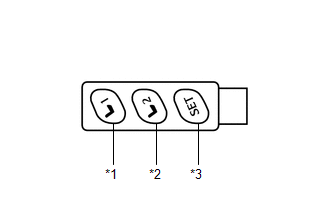 The SET, M1 and M2 seat memory switches are shown in the illustration. The seat position will not be stored if the SET switch and 2 of the seat memory switches are pressed simultaneously. (a) Turn the ignition switch to ON and check that the P position indicator is on. (b) Move the seat to the foremost and uppermost positions using the position control ECU and switch assembly. (c) Check that the buzzer sounds for 0.5 seconds and the seat position is memorized when the M1 switch is pressed within 3 seconds after the SET switch is being pressed. The seat position will also be stored when the M1 switch is pressed while the SET switch is being pressed. The seat position will not be stored when the SET switch and M1 switch are pressed simultaneously. (d) Move the seat out of the foremost and uppermost positions using the position control ECU and switch assembly. (e) Check that the buzzer sounds for 0.5 seconds and the seat position is memorized when the M2 switch is pressed within 3 seconds after the SET switch is being pressed. The seat position will also be stored when the M2 switch is pressed while the SET switch is being pressed. The seat position will not be stored when the SET switch and M2 switch are pressed simultaneously. (f) Check that the buzzer sounds for 0.1 seconds and the seat automatically moves into the foremost and uppermost positions (memorized positions) when the M1 switch is pressed. (g) Check that the buzzer sounds for 0.1 seconds and the seat automatically moves out of the foremost and uppermost positions (memorized positions) when the M2 switch is pressed. (h) Turn the ignition switch off and open the driver door. Check that the buzzer sounds for 0.1 seconds and the seat automatically moves to the memorized position by pressing the M1 or M2 switch within 180 seconds after the ignition switch is turned off. (i) Turn the ignition switch off and close the driver door. Check that the buzzer sounds for 0.1 seconds and the seat automatically moves to the memorized position by pressing the M1 or M2 switch within 60 seconds after the ignition switch is turned off. (j) Operate the front vertical function of the position control ECU and switch assembly to tilt the seat down 3 times. Within 10 seconds after operating the front vertical function of the position control ECU and switch assembly, operate the lifter function of the position control ECU and switch assembly to tilt up and the reclining function of the position control ECU and switch assembly to recline the seat simultaneously. Hold both switches for 10 seconds. The buzzer sounds for 0.5 seconds when the memory is cleared. The front seat and outer mirror surface position automatically move to the stored positions. The registered transmitter key recognition code is recalled automatically. If the automatic memory call function is not operated, the buzzer will not sound. (1) With the ignition switch off and the driver door closed, press and hold the M1 or M2 switch while carrying the key*1 or pressing the lock/unlock switch of key*2. The main body ECU (driver side junction block assembly) will enter transmitter key recognition code registration mode to allow a key to be linked to the mirror surface memory position. (2) When the manual LOCK or UNLOCK switch on the power window regulator master switch assembly is pressed, check that the buzzer sounds for 0.5 seconds. (1) With the ignition switch off and the driver door closed, press and hold the SET switch while carrying the key*1 or pressing the lock/unlock switch of key*2. The main body ECU (driver side junction block assembly) will enter transmitter key recognition code deletion mode. If the memory switch is released before entering deletion mode, the memory switch will not enter deletion mode. (2) When the manual LOCK or UNLOCK switch on the power window regulator master switch assembly is pressed, check that the buzzer sounds twice (0.1 seconds each time). (a) While a memory call function is operating, check that performing one of the following will stop the memory call operation: 1) press the SET switch, M1 switch or M2 switch or 2) press the position control ECU and switch assembly.